Dr. C. Michael Willock, a noted holistic dentist in Chapel Hill, finds that “a significant majority of people who come to see me are dealing with dental issues that are self-inflicted and preventable. “The most frequently occurring and treatable dental problem seen in adults today is gum disease, affecting up to 50 percent of the US adult population, ages 30-70, and 90 percent of adults older than 70. Gum disease is defined as a mouth teeming with bacteria that form a sticky, colorless plaque on the teeth. When teeth aren’t brushed routinely and properly, this plaque can eventually harden into tartar that can only be removed by professional cleaning. “If plaque and tartar aren’t removed,” explains Dr. Willock, “they become more harmful causing bacterial inflammation of the gums called gingivitis. The first sign of it is red and swollen gums that bleed easily. Fortunately,” he notes, “with proper brushing and flossing this stage can be reversed without loss of bone or tissue. 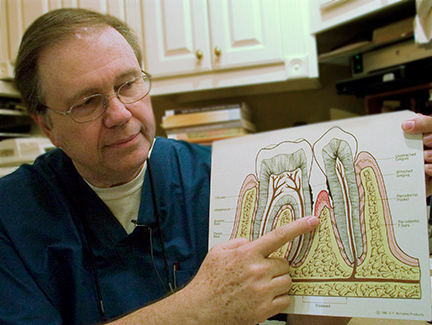 Dr. Willock notes that there are many warning signs of periodontal disease: gums that bleed easily and are red, swollen, or tender; persistent bad breath or bad taste in the mouth; gums that have pulled away from the teeth; changes in the way teeth fit together when biting; and changes in the fit of partial dentures. The link between periodontal disease and diabetes is well established, notes Dr. Willock. “Studies show that people with diabetes are more likely to have periodontal disease because diabetics are more susceptible to contracting infections. Patients with poorly controlled type 2 diabetes are more likely to develop periodontal disease than are well-controlled diabetics. Studies associate obesity with increased oral health problems as well, he notes. “Obese patients have a tendency towards more tooth decay and missing teeth. Problems are increased with use of prescription drugs which can cause extreme dry mouth. Poor diet, excessive heartburn, and possibility of increased vomiting all lead to dental problems. “The UNC Oral Health Institute, in Chapel Hill, did a study linking periodontal disease and obesity. This study indicates that obese patients have a higher prevalence of periodontal disease due to what researchers call ‘chronic nutritional stress.’ They have identified bacteria called MicroRNA that is much more prevalent in patients with a high body mass. He adds, “The saddest sight is seeing a patient who has been abusing methamphetamine. That drug is probably the most destructive to oral health that I’ve ever witnessed. The first course of action is to extract all the teeth that are beyond repair. The remaining teeth can be saved by either a filling or crown, inlay or onlay. But the first thing to do is get the bad ones out quickly and initiate healing. The worst-case scenario is meth mouth—it’s nasty. Imagine about 28 or 32 rotten stumps all the way around the top and bottom of the mouth. Our recommendation is to pull out all the dead teeth and let the mouth heal. Then we can always make a denture. But that’s probably going to be the best scenario they’re ever going to have.